List your motivations, objectives, tricks, supporters and cessation methods to help you resist smoking. Indicate your main motivations (try to target 3 choices or fewer). Indicate your main objectives (try to target 3 choices or fewer). To be in better health: improved cardio, coughing less, lower blood pressure, etc. To find other ways to unwind: relaxation, yoga, Pilates, etc. To take pleasure in other activities: getting fresh air, cooking, reading, doing carpentry, gardening, etc. Indicate the main tricks you plan to use (try to target 3 choices or fewer). Identify the people you can contact at any time to support you in your process to quit smoking. For support at all times, call the iQuitnow helpline - 1-866-527-7383. Write the name and contact information (phone number, email) of your supporters. Enter the medication you will use to quit smoking. Consult a health care professional such as a doctor or a pharmacist in order to determine the medication that is best suited to your situation and your state of health. Make sure that you follow this treatment by respecting the dosage, frequency and duration as prescribed. Your modifications have been saved. Thank you! A registration confirmation has been sent to you by email. To ensure you receive Quit to Win! Challenge emails properly, please add capsana-noreply@capsana.ca to your contacts. To be eligible for the Challenge, you must stop smoking between December 20, 2018 and February 4, 2019, and not smoke from February 4 to March 17, 2019 inclusively. I would like to receive encouragement e-mails, sent over a 1-year period following my quit date. I would like to receive informational emails from Capsana's partners. I would like to be contacted by a counselor from the iQuitnow helpline to receive personalized support in my smoking cessation efforts. Better understanding why you smoke can help you find ways of dealing with your triggers. 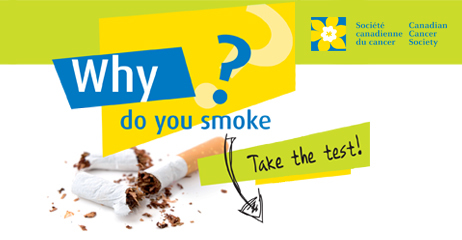 The Canadien Cancer Society (CCS) invites you to take the Horn Test so you can determine what factors drive you to smoke. A total of more than 10 points indicates you have a reason to smoke. This will point out the first priority you should address to quit smoking. For you, smoking is mostly a source of stimulation. You think that smoking increases your concentration, gives you courage and motivates you. Nicotine is indeed a stimulant, but you can do without it or find healthier alternatives. For you, smoking is more associated with the pleasure you get out of it rather than with the physical dependency. Be creative and you will surely find something else to enjoy. You smoke mostly to relax and escape. In a nutshell, smoking makes you feel good. But there are other, far less dangerous ways of relaxing. Think about it! For you, smoking is a way of dealing with emotions like stress, anxiety or boredom. You find smoking comforting and soothing. Rest assured that you can deal with your emotions without smoking. For you, smoking is first and foremost a physical need. You have the urge to smoke as soon as you wake up. Fortunately, you can put an end to this slavery and be free again. You smoke mostly out of habit. It's more of a reflex than a necessity. You can't imagine certain daily situations without a cigarette: after a meal, with coffee, during work breaks,etc. Just be aware that you can replace these associations with healthier ones. To help you stay motivated, here's a preview of what smoking costs you. Your savings calculation has been modified. Your friends smoke? Challenge them and double your chances of winning the grand prize.